Newcastle Falcons continued their Premiership revival with a third victory in four games, beating Gloucester at Kingston Park. John Afoa's try put the visitors ahead in the first minute of the match but four Rory Clegg penalties gave Newcastle a narrow advantage. Sinoti Sinoti's score extended the Falcons' lead, before Clegg and Billy Burns traded penalties. Gloucester pushed late on but were unable to secure a losing bonus point. The results means Dean Richards's side made it back-to-back wins at Kingston Park for the first time since 2009, following the pre-European win against Exeter. Meanwhile Gloucester saw their losing league run move onto three games, with a long trip home from the north east. The home crowd were silenced straight from the kick-off when Gloucester captain Matt Kvesic charged down a Clegg exit kick and Afoa crossed to score inside 30 seconds. A head injury to wing Charlie Sharples forced an early stoppage and reshuffle for Gloucester, and Falcons responded well after play resumed. Clegg made amends for his early error from the tee, taking advantage of the Falcons' dominance at the contact area to kick three first-half penalties. Dan Robson added to Gloucester's woes by following Sharples down the tunnel through injury, but Newcastle were unable to extend their 9-7 lead before the break. The savage wind was against Newcastle in the second half but, following Clegg's fourth kick, Sinoti finished off in the right from some solid, powerful phases. Burns's penalty kick reduced arrears but another Clegg penalty restored the 10-point cushion. Andy Saull's trip to the sin-bin for an off the ball tackle gave David Humphreys's side the chance to press late on, but a huge defence from the hosts earned them the four points. 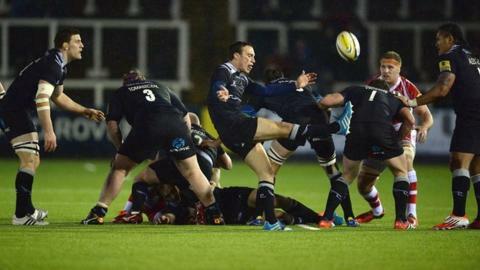 "We're delighted, the boys showed a lot of character after conceding early try. "It was the the kick up the bum we needed - we knew it wouldn't be easy and we had to stick to our guns. "We came in after the first half a bit down in terms of points, but in the second half we had to go out there with our back against the wall and play hard. I was delighted for the boys. "We played the wind and the conditions really well. We didn't flinch and played some really good stuff." "We felt a little bit disappointed with the penalty count at 9-1. For a team that's been hugely disciplined throughout the course of the season, that's something we need to have a look at. "Tonight is was down to our mistakes, that's what caused us the problems. "(There was) probably a little bit of naivety on our part, with a minute or so to go, not to take a kick at goal to get the bonus point. "When you consider that, in that second half, we basically were playing with 20 players unavailable, having lost the three to concussion, we really tested the depth of our squad." Newcastle Falcons: Tait; Sinoti, Tiesi, Socino, Tuilagi; Clegg, Blair; Vickers, Lawson, Tomaszczyk; Green, Barrow; M.Wilson, Saull, Hogg (capt). Replacements: McGuigan, Rogers, S.Wilson, Robinson, York, Fury, Powell, Hammersley. Gloucester: McColl; Sharples, Meakes, Atkinson, Purdy; Burns, Robson; Thomas, Dawidiuk, Afoa; Palmer, Hudson; Savage, Matt Kvesic (capt), Moriarty. Replacements: Cole, Gibbons, Knight, Stooke, Evans, Braley, Thomas, Isaacs.